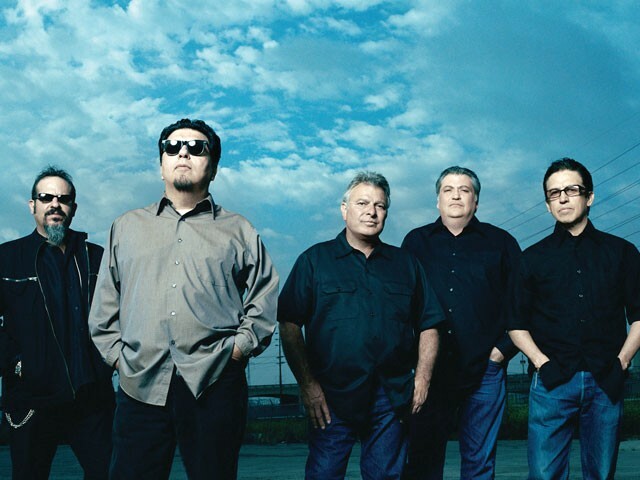 Los Lobos have stayed faithful to their roots for 35 years. Los Lobos is a blue-collar band. For 35 years they’ve put their heads down and their hearts out there, creating music true to their geographical and musical roots. They’ve maintained the same lineup and restless spirit that entire time while surveying a mix of Latin, Americana and rock music. The Los Angeles quintet enjoyed their moment in the spotlight in the ‘80s (remember La Bamba?) — but they didn’t cling to it. They were content to get back to making the music they loved. That’s the nature of their dedication: They’d never cheat on the music. That attitude has rewarded them with a catalog that reads like a multi-cultural songbook, tracing the traditions both of the band’s Mexican heritage and of American roots music from folk and country to soul, blues, and rock. Los Lobos formed in the early ‘70s in East Los Angeles. After years of hustling for gigs anywhere — weddings, parties, restaurants — they landed a major-label deal and released the critically lauded How Will the Wolf Survive?, giving T-Bone Burnett his first big production credit. Their big break came a few years later when they recorded some Richie Valens covers for the biopic La Bamba. It hardly seemed like the thing to make them famous. “When we did it, the movie hadn’t even cast the Lou Diamond Philips role. They were asking us, ‘Don’t you have any friends that can sing?’” Berlin recalls. “As we were doing it we thought, ‘This isn’t going anywhere.’ Then much to our surprise …” “La Bamba” went to No. 1, and for a while Los Lobos was white-hot. Yet they weren’t interested in cashing in. They followed their success with La Pistola y el Corazón, a set of nine norteño songs, blending Tex-Mex and mariachi sounds. Not the most commercial play after a top hit. Despite some terrific releases, including their last several — notably, 2004’s star-studded The Ride and 2006’s crisp and colorful The Town and The City — last year’s Tin Can Trust won them their first Grammy nomination in more than two decades, including one for the best Americana album of the year. (They lost to Mavis Staples and Jeff Beck). The album is a low-key, rock-tinged tribute to scrappy survivors in tough times. With time Los Lobos has carved out a genre of their own, and their fans appreciate that.